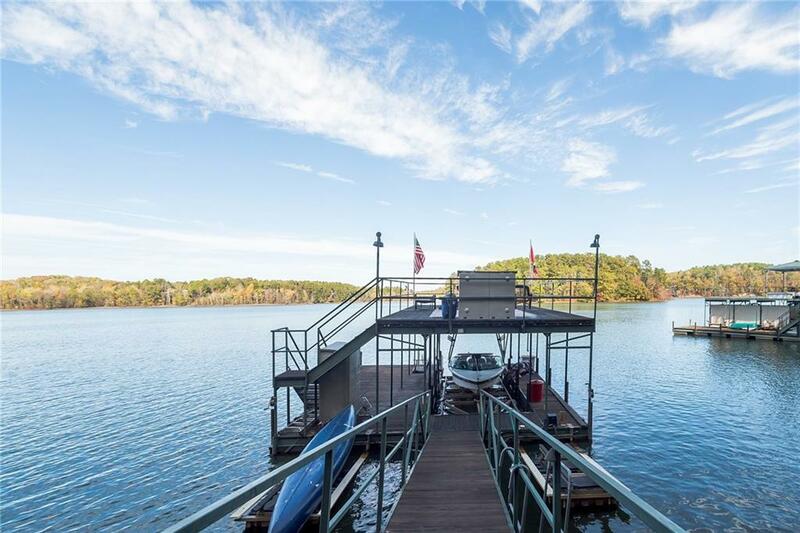 Huge views, deep water, and an easy drive from I-85 are just some of the benefits of this remodeled Lake Hartwell waterfront cabin. Exterior improvements made over the last 3 years include exterior paint, new roof & gutters, outdoor shower with hot & cold water, a 2 story steel dock (26'x28' with a 60' gangwalk), 2 jet ski lifts, and a Carolina Lift. On the inside, all flooring has been replaced, a stone fireplace, and the kitchen has been completely updated with new custom cabinetry, granite countertops, under cabinet lighting, and all new stainless steel appliances (refrigerator, range, built-in microwave, dishwasher, & ice maker). The bathroom has been remodeled to include travertine tile, walk-in shower with frameless glass door, new toilet & vanity, as well as a wood ceiling. Off the living area is a large screened porch and small deck with breathtaking lake views. A large rec room & covered deck are located on the lower level. Located right on Lake Hartwell's Seneca River near the mouth of Camp Creek, water levels will never be a concern! The circular driveway will provide plenty of parking space for all your guests, and there's room to add a garage if desired. Listing agency is providing a 1 year home warranty through Old Republic.